Welcome to our Serious Gaming session approach! Serious Games are very popular to, for instance, safely experiment in a difficult context, get to know your team dynamics, or, to understand the results of a complex project without your CEO, management board or your client having to read the report. Serious Games make you experience situations, make you feel the impact of your decisions and make you realize how complex situations work. They provide a safe but serious 'playground' in which people can learn by doing and experimenting. We have Serious Games in our portfolio for many different situations. Some examples are the commonly used TeamUp, designed to improve team performance and (re)design teams, and, a game to understand the Policy Making and Decision Making context of large infrastructural mobility projects. We have also developed a card game that helps improving cooperation among young people and children. It can very well be that any of the games we have in our portfolio can be applied to your benefit in your situation straight away. It might just as well be that you have different objectives in your situation and look for a customized application of an existing serious game. Or, that you look for a newly designed game completely tailored to your situation. Just click on the buttons so we can contact you and discuss together how we can help you with a serious gaming solution for your situation. My situation is completely different from all situations described below. Please contact me to discuss serious gaming solutions for my situation. Having a good team around you can get you anywhere you want. At the same time, team dynamics are a very common source of problems and frustration. TeamUp makes team members experience their team dynamics. Through observation and quantitative recorded game data, a professional group dynamics facilitator discusses team roles, cooperation and performance. A TeamUp session improves team performances by re-discussing roles and behavior. Typical sessions, depending on the specific objectives of a team, range from half a day to a full day. TeamUp sessions can also facilitate the design of a new team for a specific important task lying ahead. Such sessions include for instance personal interviews and team role tests. All information is used in the second half of the session to design a team such that it is best suited for the new task. When organizations work together on a joint sector product, like in case of public transport, understanding each other’s work settings is crucial in the cooperation to come to a high quality end product for the customer. To have added value with your company, you have to understand how all organizations involved together influence the final customer product. Experiencing what, for instance, a train operating company does or traffic control is not that difficult. The closer you are in the chain to the final product, the more concretely visible the influence. However, experiencing the policy and decision making process at the beginning of such a chain is much more difficult. Not only is such a policy making more abstract and less concretely visible, it also has it's own rules and 'political rationality' logic under which it operates. 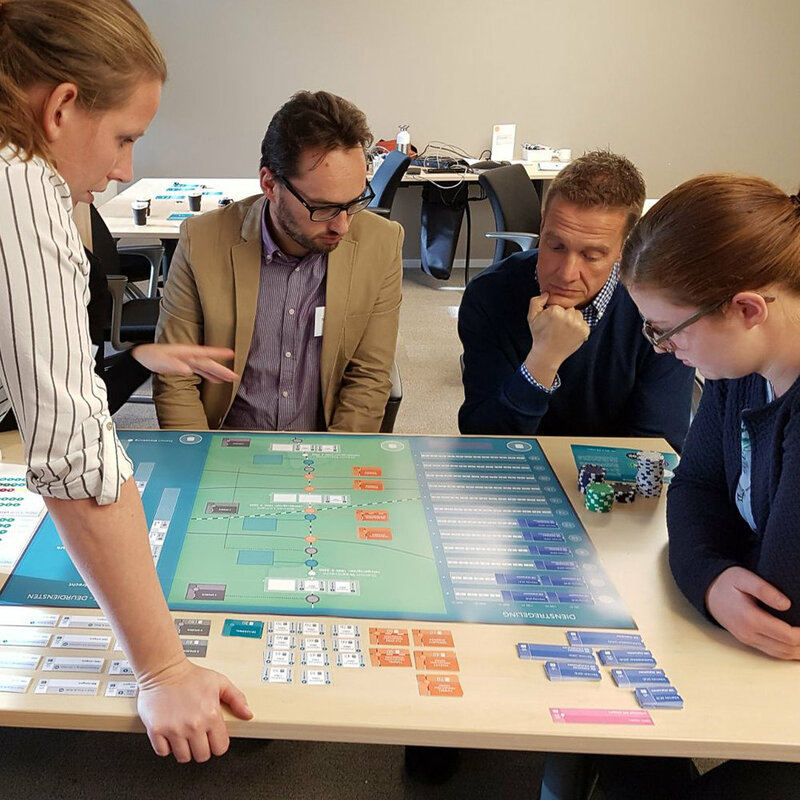 Together with our partners we specifically designed a serious game to help people experience and understand the added value of the policy making and decision making process in the overall product chain.